I’ve long had issues with grades. Possibly this goes back to when I spent 6 of the 8 quarters of my middle school years grounded because of my grades (Cs). But maybe not. Regardless, grades have been a bee in my bonnet for the great majority of my teaching career. When I have adjuncted and taught grad students it has been even more frustrating to me. Grades felt like a judgement and I did not feel qualified to judge. I had plenty to offer as their professor, but judging their work seemed a step to far. Offering feedback was fine (if more work) so I did plenty of that. My district moved to standards-based report cards at the elementary level some years ago. That was a step in the right direction, in my mind, but only a baby step. The end of each quarter causes me to be super cranky as I have to input grades for my students. If the purpose of grades is communication with families I believe we are falling far short. Let’s say a kid gets a B in math for a quarter. What does that mean? Does it mean that child is above average in math? Could it mean that the child seriously excelled in the geometry unit but struggled in the fractions unit and that averaged out to a B? 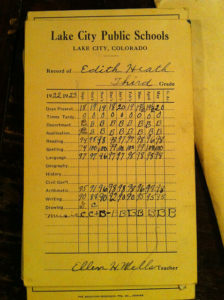 How on earth would parents get that information from a letter grade on a report card? If our goal is to communicate student progress to parents we need a better option. I believe grades are far more about competition than they are about communication. Unless kids are making As, and maybe some Bs, parents tend to get upset. In spite of the fact that those letters often mean very little. We’ve got our kids chasing a brass ring but the destination is constantly moving because different teachers assign grades in different ways. But we’ve made grades the end all and be all of education. We’ve made letters on a progress report more important than learning students are doing. We’ve shifted the focus because it’s difficult to compare student learning but it’s easy to compare student grades. That is a terrible thing to realize about our system.